How would you like to win your very own tub of ice cream? It's smooth and tasty, and BIG, over 11 litres. 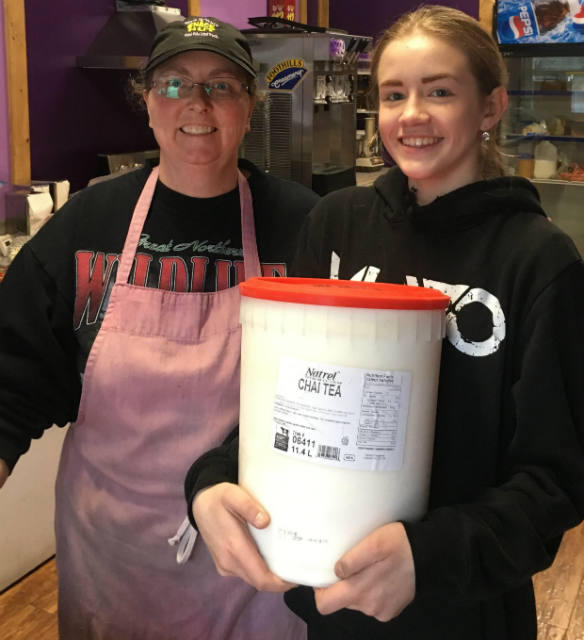 Mark & Niki's Snack Hut will give away six tubs of ice cream over the next few weeks. Don't wait, hurry over to the Snack Hut and fill out an entry form. Emma Toth did that and look what she won. We hope she got it home before it melted or strained her back. Open Tuesday to Saturday from 11AM to 4PM for take out, the Snack Hut serves up tasty delights including homemade soups, chilli and muffins. Be sure to try a 100% all beef chilli cheese dog, or if your really adventurous add chilli to your muffin. Mmmm, good! Niki has used POS-n-go for the last seven months and is thoroughly satisfied with its performance and ease of use. The extensive sales and tax reporting makes running her business a breeze and helps save money on accounting fees. Great Ice Cream Giveaway entry forms available only at Mark and Niki's Snack Hut located in the Platzl, Kimberley. These BIG tubs wont last long!